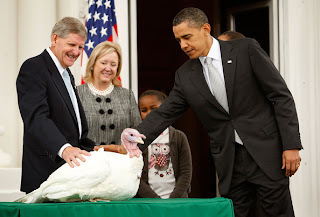 Every year, at least since sometime in the middle of the last century, the President of the United States pardons a turkey. The ceremony, which could be described as a kind of sovereignty kitsch, is covered by the media, becoming part of the general holiday pablum along with the stories of the new floats at the Macy's Thanksgiving Day Parade and "what to do with holiday leftovers." There is something so obviously absurd about this ritual that it is almost pointless to point it out. There is of course the question of guilt, of what crime the turkeys are being pardoned for, other than their rather unfortunate luck of coming into this world as a domesticated turkey. While the turkeys have been spared since Kennedy the use of the term pardon has a much more recent pedigree; Reagan first use the term to deflect questions about Iran-Contra, jokingly pardoning the bird to avoid answering the press. Despite this recent history for term there is, however, a symmetry between the pardon of the turkey and the holiday in general. The turkey is spared just before millions are cooked in a massive consumption of a single species: it is an idyllic symbol of peace between man and beast just before the true slaughter. Thanksgiving is supposedly the celebration of a peaceful cooperation between colonists and Native Americans: as we all know, this peaceful celebration, if it existed, comes before genocide. Each ritual is a staging of a just world that we know to be a lie. "The birds are then, in proverbial fashion, said to live happily ever after. In reality, however, they are usually killed within a year and stand-in turkeys are supplied. This goes on year after year. The chosen birds are killed because they have been engineered and packed with hormones to the point that they are unfit for any other purpose than their own slaughter and consumption. They are fast-forward turkeys. Presidential turkey caretakers have explained that most succumb rather quickly to joint disease—their frail joints simply cannot bear the weight of their artificially enhanced bodies. The sturdiest survivors may live a little more than a year. But the birds are always finally put out of their growing misery. Then they are buried nearby in a presidential turkey cemetery—the ritualistic significance of which remains to be explored. (May the archaeologists of the future excavate it!)" The reason that these turkeys are so ill suited for their lives of freedom is that they are supplied by the National Turkey Federation. They are products of industrial farms, bred to grow fat quick rather than live long. Much could be said about the fact that corporate lobby's interests trumps even the symbolism of the ceremony, making even the pardon itself a lie within a lie. The whole thing is so overdetermined, a "turducken" of empty symbolism, sovereign authority, and corporate power. However, my mind remains fixated on that cemetery of (what I imagine to be) unmarked graves where the birds go, unable to bear the weight of their supposed freedoms. They are creatures designed for the cage, and no decree can change that. Yep, the holiday really symbolizes the nation. He also explains that now the turkeys are sent not to Disneyland, but to George Washington's house. The whole farce is rich in some much symbolism and meaning. Thanks for the link. I really enjoyed reading Magnus Fiskejö's work on the whole thing. It is a very strange and symbolically dense ritual. It seems more like something out of a darkly satirical novel than reality.